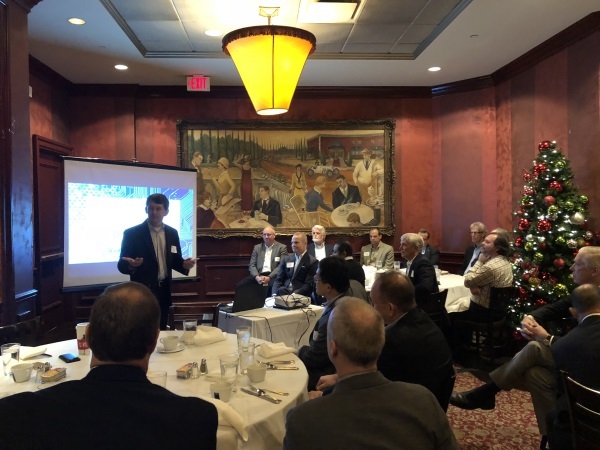 SIM Chicago hosted our final event of the calendar year 2017 on December 7th with a "SIM in the Suburbs" breakfast at the Clubhouse in Oak Brook featuring Glenn Schneider, CIO of Discover Financial. Glenn was named 2017 CIO of the Year for his transformational IT leadership of this $11B banking and payment services company. If you know peers and colleagues that may be the 2018 CIO of the Year, please see the information at the end of this email to nominate them! The event was well attended, entertaining and above all informative. I always leave a SIM event with new ideas, shared experience of others, or even just a catchy phrase that I can use to better communicate with my team. In this case, I took away a little nugget offered by Glenn that describes the essence of Agile methods as practiced at Discover: "Make progress, not perfection", or to paraphrase, don't get hung up in analysis paralysis. Certainly perfection is nice, but not always required to meet requirements of the task at hand. Please join us for our next event, Tech Talks, in partnership with Chicago Innovation Awards on Tuesday February 20th at Studio Xfinity, 901 W. Weed St. in Chicago. Newer Post2018 New Year's Resolutions!